Holidaymakers avoided a long delay to their flight home when a passenger fixed a mechanical problem with their plane. Passengers on Thomas Cook flight TCX9641 from Menorca were told to expect an eight-hour wait while an engineer was flown out from the UK. 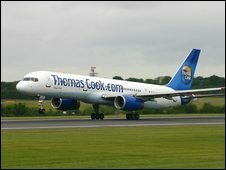 The passenger worked for another airline, Thomson Airways, which has a reciprocal maintenance agreement with Thomas Cook. Holidaymaker Keith Lomax, from Stirling, was travelling home from a week's break with his wife when the plane's captain announced the expected delay. "We were in the plane, ready for take-off, when he announced there was a technical problem and that an engineer might have to be flown out from Manchester to fix it," he said. "Then a stewardess told us there was an engineer on board and they were checking out to see if he could work on it. He was obviously successful. When he came back onto the plane there was a round of applause from the back of the aircraft. "It was reassuring to know the person who had fixed it was still on the aeroplane. What are the odds of something like that happening?" Chris Browne, managing director of Thomson Airways, said she was "delighted" that one of the company's engineers came to the rescue of fellow passengers "even when the flight was that of a competitor". She added: "This kind of initiative exemplifies Thomson's company philosophy of exceeding customer's expectations and it makes all of the team at Thomson Airways extremely proud. "Flight delays can be very frustrating for everyone involved so it was gratifying that a qualified Thomson engineer, who has been with the company for 27 years, was in the right place at the right time."